Dave lives in a two bedroom, two bath, apartment in Mar Vista with his roommate, Jeff. Mar Vista means “sea view”, although you can’t see the sea from there. Although it is only a few miles away from the Ocean. So, it’s a quick drive or a long walk to the sea. Jeff works a regular part-time and is also an actor, mostly in television. He’s gotten some day player roles on some pretty big shows and commercials. It a good creative offset. The two of them have a lot similar experiences as far pursuing creative things. There isn’t a ton of extra significance to the couch as far as Dave knows. 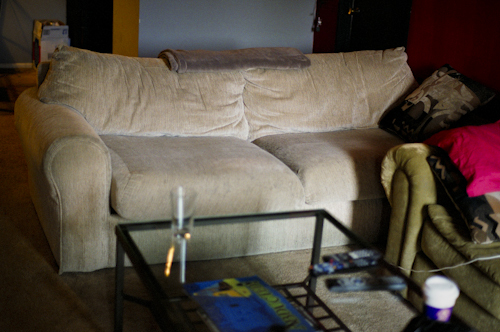 The couches are Jeff’s and were there when Dave moved in, so Dave doesn’t have a great “this is how I found the couch” story. He doesn’t know where Jeff got them. Dave found the apartment on craigslist. Jeff had been there like 10 years when Dave moved in. Because it was rent controlled, the rent was a lot lower than places around it. This was the only place he looked at in this part of town, but between the ad and meeting Jeff, Dave knew it was the kind of place he wanted to be in. He had trouble with a lot apartments, because people don’t understand what your job is when you work for yourself and are creative. Dave has never not paid rent his entire life, but explaining that was not good enough. Many people want a tenant with an office job. However, Jeff totally got it, because when he gets a big commercial he also doesn’t work regular jobs for a year or more. Dave has slept on both couches in the apartment and thinks they are pretty comfortable. Dave writes and performs music and comedy. (http://daveellismusic.com/) He also won a lot of money on a game show and he’s still riding that out. Writing and playing music is the most fun for Dave. That is what he spends the bulk of his time doing. Sure there is business and work involved, but the reason that he writes and plays is that it is fun. Besides that, Dave goes to a lot of other shows and hangs out with friends. Dave also likes to try new things. He recently went bungee jumping for the first time. As part of a wilderness hike with some friends, he jumped off a bridge a few times. Dave likes to push his comfort zone and do things that scare him.